I’ve read, as I’m sure you all have, about how important it is for families to sit down to dinner together every day. In my house that almost never happens. The kids need to eat before 6, and getting home by then is pretty hard for Mr. December. What’s a mom to do? We don’t do anything fancy. Generally we’ll alternate having oatmeal or cold cereal on the menu. I set out bowls, spoons and mugs the night before, and if it’s a cold cereal day then I’ll put that out too. I cut up some kind of fresh fruit and put it in the fridge. For oatmeal days, I start the steel-cut oats the night before, then leave them to soak overnight. 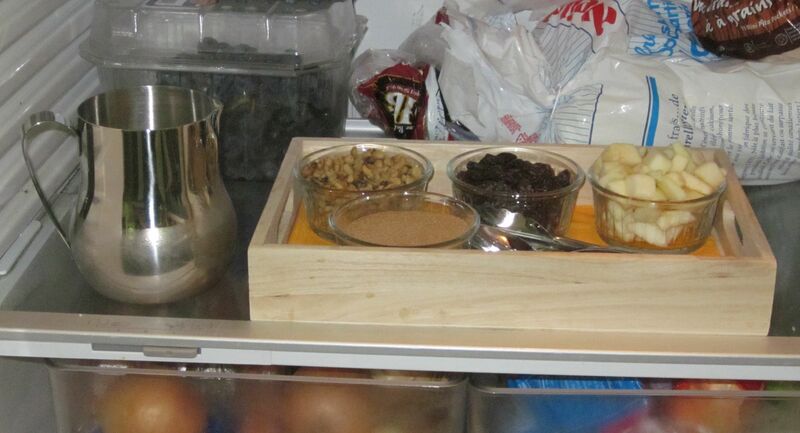 I prepare a tray of toppings and a small jug of milk and put those in the fridge where K can reach them. In the morning, I just have to turn on the oatmeal for 10 minutes (I do it right when I get up, and by the time we’re all dressed the oatmeal is done). K’s job is to take the tray of toppings out of the fridge and bring it to the table. When N sees this happening, he goes to the play kitchen (also where we keep the kids’ dishes and cutlery), gets himself a spoon, and then stands patiently by his chair until we help him in. Both K and N seem to take pride in doing their parts to get ready for breakfast. And of course, everybody loves their oatmeal. We have different toppings every day. 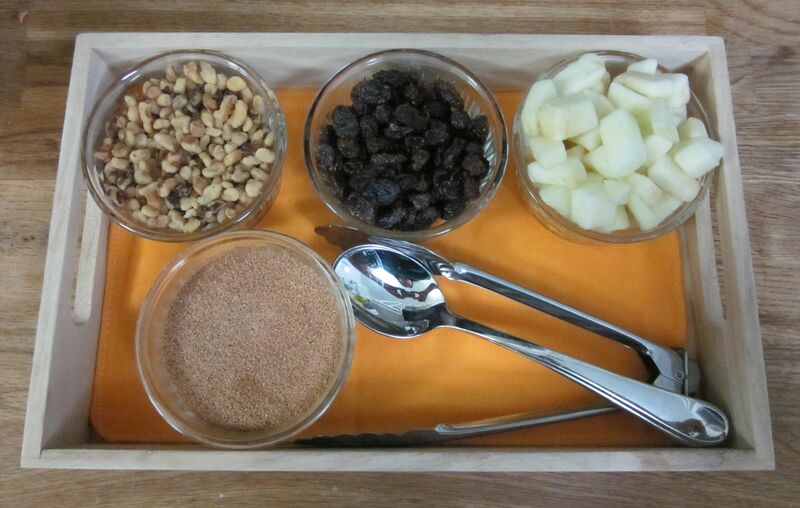 The tray above is what I call “apple pie” – apples, raisins, walnuts, and cinnamon sugar. We also do “banana nut” – brown sugar, pecans, and bananas. “Cranberry almond” is pretty much what it sounds like – dried cranberries, slivered almonds, brown sugar. To give you a sense of size, that’s a 500 mL (2 cup) jug. It’s maybe 5 inches tall. Mmm… oatmeal and toppings. This post has made me want to go to sleep so that I can wake up and eat breakfast. Yum. Just letting you know that I am thinking about you, and was in your position just over 3 months ago. I really understand the wanting everything to go smoothly so that you can have the home birth you want. If you aren’t labouring as I write this, I hope the moment comes soon for you.